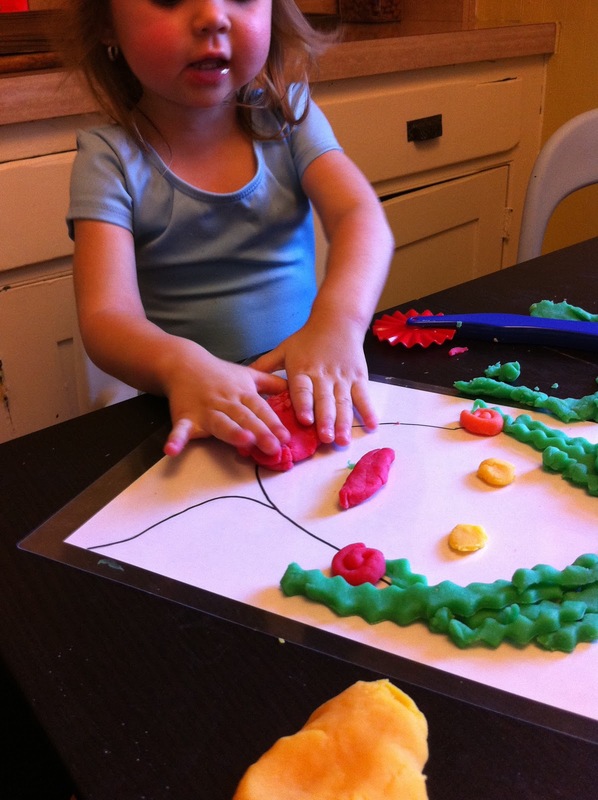 Play dough is a favorite past time in our house, so I am always looking for fun play dough ideas. I must have seen this idea for play dough place mats somewhere a long time ago but I can't remember where, I even checked Pinterest to see if I had seen it there but I don't think so. Anyway a few weeks ago my sister posted a photo of my nephew playing with a new plate he had gotten for the holidays. It was one of those ones with the face and you can arrange the food to change the face. The picture made me think of play dough, because that's just how my mind works. I thought it would be fun to make a version of the plate just for play dough. I started by drawing the shape of a head on a piece of paper then traced over the lines with black sharpie. I then thought about how most of the time the girls love to make play dough food. 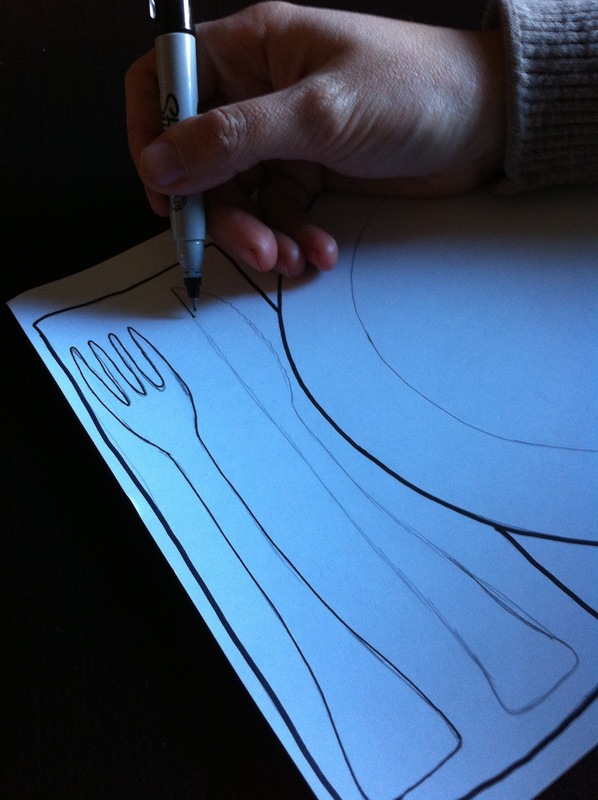 So on a second sheet I drew a plate, knife, fork and napkin. I didn't make the drawings huge just a regular 8x11 sheet of paper, so the place mats would be easier to store. I then purchased a few of those no heat laminating pouches at the store, I think they were 10 for $5.99 but you could also just use clear contact paper. As a teacher I used to spend a lot of time fighting the laminating machine, so I was happy to find the laminating pouches were much easier to use and have a nice thick and easy to clean finish. After the mats were sealed in the laminating pouches we got out the play dough. The girls had a great time playing with both mats. The took turns making food, and crazy hair. We all loved making silly people and had fun moving the facial features around to change up the person. When the girls lost interest I wiped the mats off and put them away for another day. I like the open ended creative play possibilities of these mats and now that I have made these two I am excited to try and make some different ones for more fun play dough play! Both ideas are so cute. But I am partial to the face mat. I think the preschool at church NEEDS some of these!!! Thanks for sharing your ideas. I am sharing this on Twitter. Oh, that looks like so much fun! My kids would love that project. We'll just have to do it before we do a deep cleaning. Playdough is not my friend!